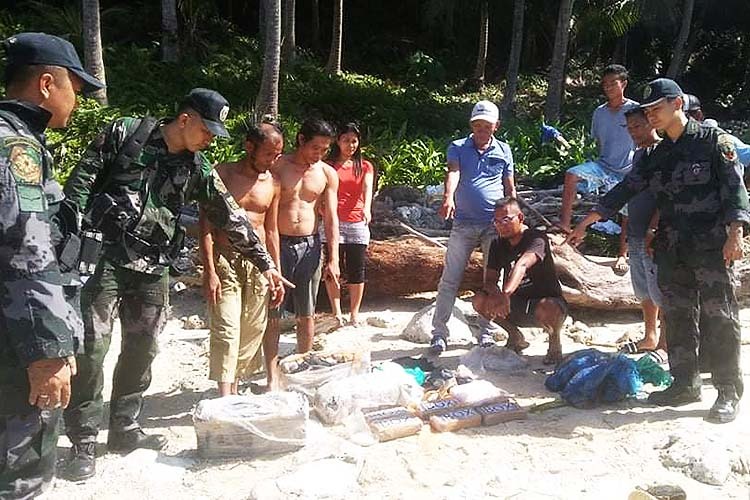 DAVAO CITY – Residents of Davao Oriental coastal town of Caraga fished out 39 bricks of cocaine worth PHP215 million Sunday, prompting the Police Regional Office (PRO)-11 to ask the Philippine Coast Guard (PCG) to scour the province’s coast. Consisting of four bundles, residents of Purok Talisay in Barangay Santiago found the cocaine bricks at around 1:30 p.m. Sunday. At past 11 a.m. Monday, three more bricks were fished out in the same area where the cocaine bundles were found, police said. Chief Supt. Marcelo Morales, Police Regional Office-11 director, said he has already requested the PCG to scour the area as there may be more cocaine bricks that are still floating in the Pacific coast. In a press conference Monday, the Davao City Police Office (DCPO) and Philippine Drug Enforcement Agency (PDEA) presented the recovered bricks of cocaine bricks brought from the area by village councilor Emeliano Bantayan of Barangay Santiago. Bantayan was escorted by the local police and the Army’s 701st Infantry Brigade. Morales said the bricks of cocaine were similar to the 34 bricks found floating off the waters of Surigao del Sur based on the packaging. “These are subject of our investigation. We have to determine the source and origin,” Morales said. Rivera, however, said the bricks found in Caraga appeared to be new, while the ones found in Surigao del Norte and Dinagat provinces two weeks ago already have moss on the boxes. Rivera said he cannot discount the possibility that the bricks were intentionally dumped. “We have asked the residents to be wary of their area and to immediately report to the police if they see suspicious items,” Rivera said. Morales said that based on the list obtained by PRO-11, at least 20 domestic and foreign vessels passed through the waters of Davao Oriental seas since February 14. Morales said residents should immediately report any discovery of illegal drugs, or face legal consequences. Morales said he has also directed police units to closely coordinate with Bantay Dagat for the recovery of other items — if there are still found by the people. “The recovery of these bricks could be an indicator may pumapasok na sa Pilipinas (it has entered the Philippines). These could be part of the delivery and for whatever reason, these were dumped to the sea,” he said. Morales said the cocaine bricks could have originated from Mexico and Columbia. It may be recalled that the first batch of bricks of cocaine was fished out from the waters off Vinzons town in Camarines Norte province earlier this month. The package was brought to the Camarines Norte Provincial Crime Laboratory Office for examination and authorities found out that it contained cocaine weighing 1,026.19 grams worth PHP5.4 million.